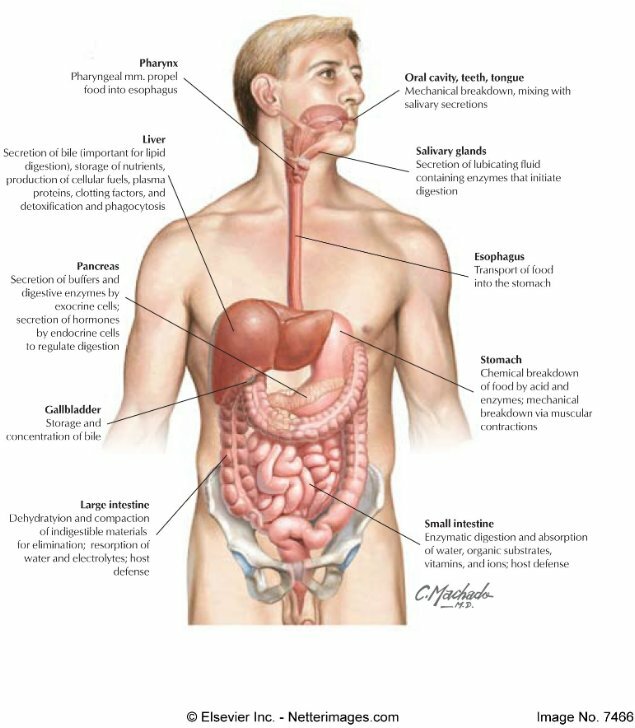 Structure and functions of the digestive organs and their associated glands; hormonal regulation of digestive juices; absorption of food; factors controlling the absorptive power and small intestine as principal site for absorption, assimilation of digested food; disorders of the digestive system – jaundice, constipation, diarrhoea, PEM and vomiting. PROCESS OF OBTAINING FOOD BY LIVING BEINGS, ITS DIGESTION AND UTILIZATION FOR ENERGY. Organisms that synthesize organic substances from inorganic substances. Organisms that use chemical energy of organic compounds synthesized by other organisms. Food is digested inside the cell- eg. Amoeba, paramoecium. 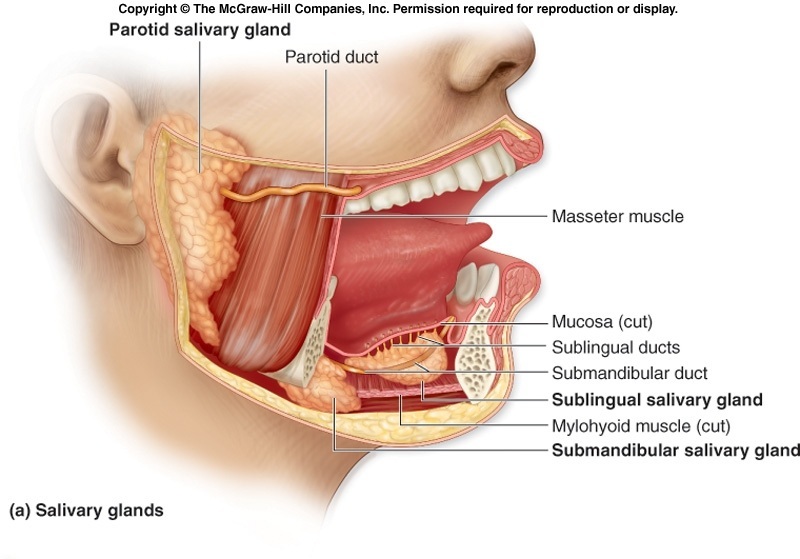 The mouth is a transverse slit like opening bounded by two soft movable lips. 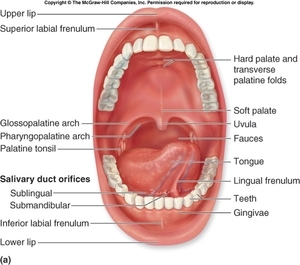 roof of the buccal cavity has two parts - hard palate with rugae and posterior part the soft palate that makes swallowing easier. 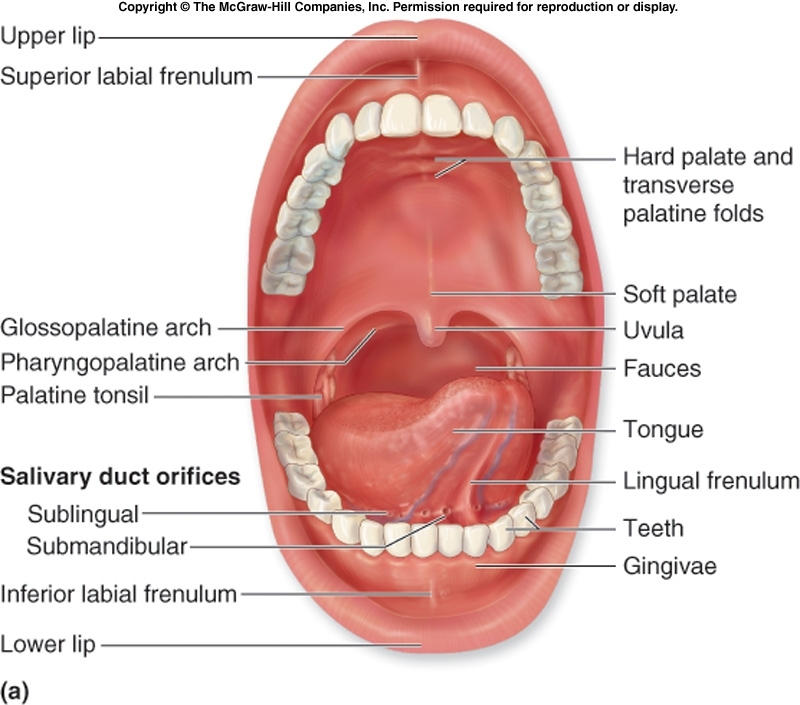 small flap the uvula or velum palati closes the internal nares during swallowing of food bolus. 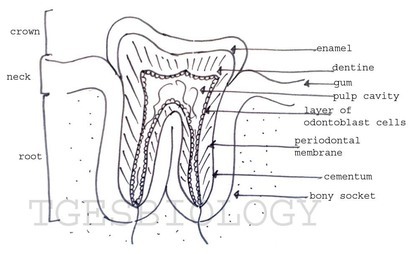 Inside the buccal cavity is present a muscular tongue and teeth arranged on the jaws. Is a skeletal muscle, helps to moves food in mouth, and to taste. Thecodont: neck and root are held in a socket. 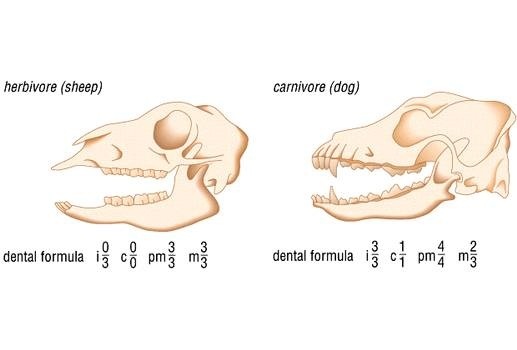 Diphyodont: milk teeth are replaced by permanent teeth. 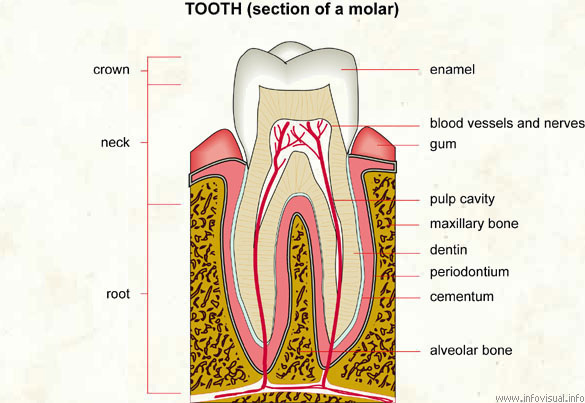 Representation of the arrangement of human teeth. It is a common passageway for air and food. 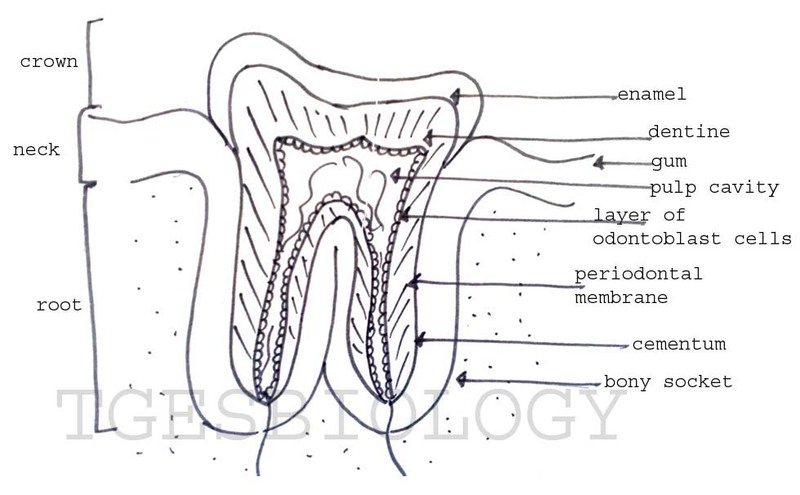 Opening of buccal cavity into the pharynx. 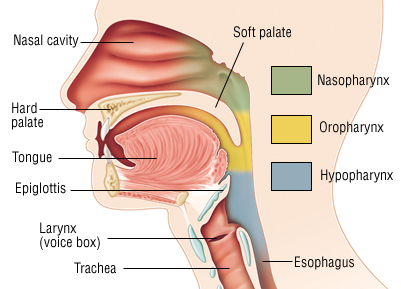 Laryngopharynx- lowest part with two openings- glottis and gullet. 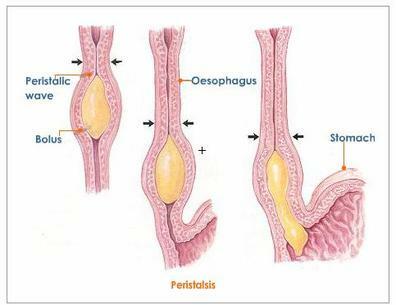 Peristalsis- contraction and relaxation of muscles which propagates in a wave down the muscular tube. Large, muscular, somewhat J shaped sac, occupying the upper left part of the abdominal cavity. Two regions- Cardiac and Pyloric. Shows the presence of longitudinal folds called rugae. Food storage, digestion, regulation of delivery. Produces gastric juice for digestion. Hydrochloric acid: produces a pH of about 2, breaks down large bits of food. Mucus: protects stomach lining from acid. Pepsinogen: with acid, begins protein breakdown. Gastrin: hormone secreted for stimulating digestion. 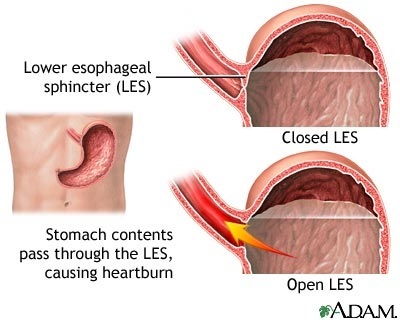 What is heartburn or acidity? 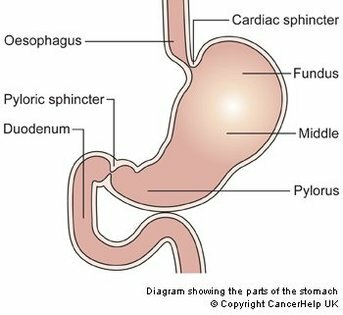 When the cardiac sphincter fails to close fully, the acidic chyme squeezes into the oesophagus. This irritates the lining of oesophagus and causes heartburn. It is less effective in infants hence regurgitation is more common among infants. Duodenum- complete digestion takes place here. Receives enzymes from the pancreas and bile from the liver. Jejunum- No digestion takes place here. 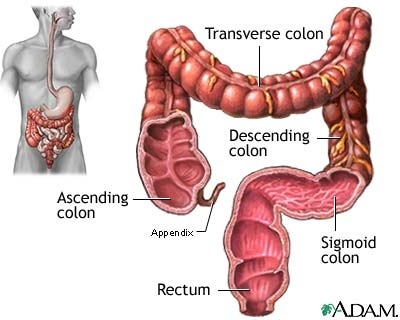 Ileum- absorption of digested food takes place here. Absorption: 95% of food is absorbed here. Mucosa adaptations: villi containing blood capillaries and lacteal. Cells of villi have small projections - microvilli. 5-6m long- enough time for digestion and absorption. Inner wall thrown into folds - increases the surface area for absorption. 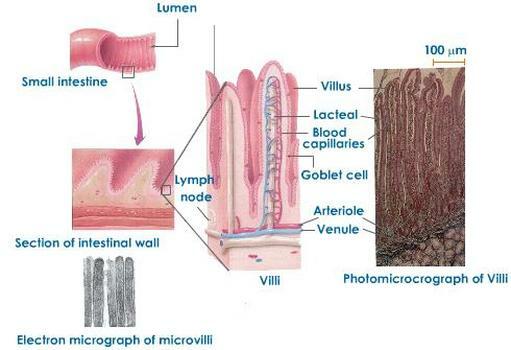 Villi and microvilli- further increase the surface area. Lacteals and blood vessels- facilitates easy absorption and transportation. Single layered epithelium- for easy diffusion of digested substances. Composition: mucin, salivary amylase, bicarbonate, lysozyme. Mucus- mixes with food and makes it soft for easy digestion. Polysaccharidase- dissolves the bacterial cell wall. Chief cells or peptic cells- pepsinogen, prorennin and gastric lipase. Microscopic glands present in the mucosa of small intestine. 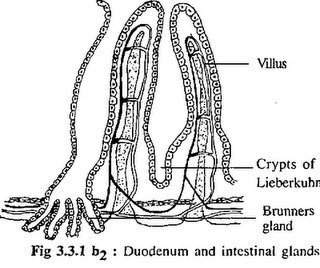 Crypts of Lieberkuhn- multicellular, straight, tubular glands present throughout the mucosa. 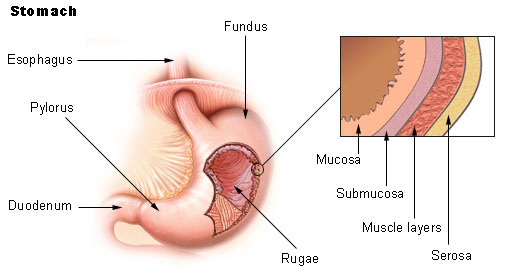 Secrete digestive enzyme and mucus. 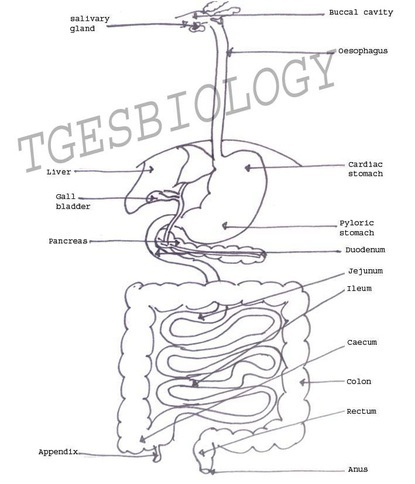 Brunner’s glands- compound tubular glands, found in the duodenum. Secrete alkaline watery juice. Pancreas is a diffused leaf shaped gland. 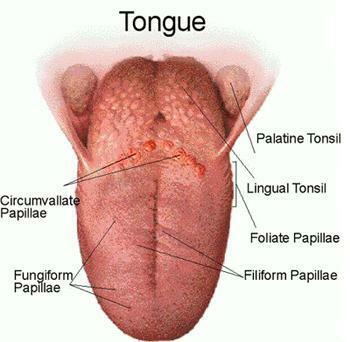 It is formed of exocrine part and endocrine part. Exocrine part is made up of lobules or acini. Acinus is formed of glandular acinous cells. These cells secrete pancreatic juice. Endocrine part is represented by patches of cells called islets of Langerhans. Liver has two main lobes:- large right lobe and small left lobe. In addition – quadrate lobe and caudate lobe are present. Liver cells secrete bile, and is stored in gall bladder. Bile is a yellowish green secretion. Salts- Na glycocholate, Na taurocholate and Na bicarbonate. 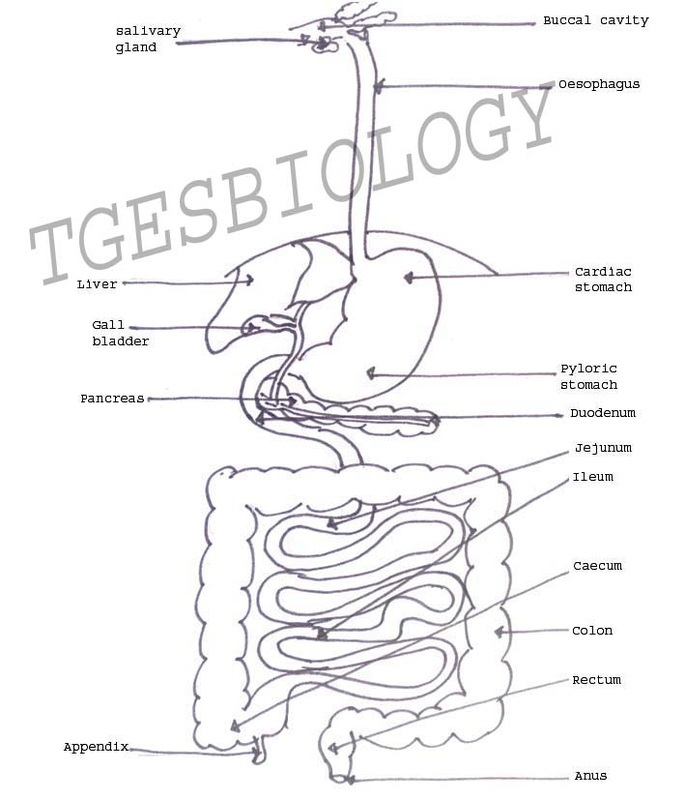 Bile is carried from gall bladder to duodenum by bile duct. The gallbladder is located beneath the right lobe of the liver. The primary function of the gallbladder is to store and concentrate bile. Excess glucose in the blood is converted into glycogen and stored. When required glucose is obtained by hydrolysis of glycogen. Glucose is synthesized from amino acids or fatty acids and glycerol. 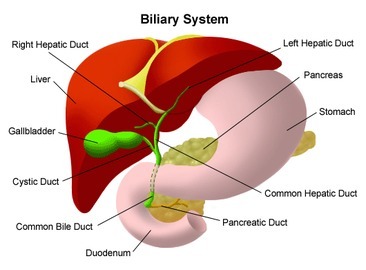 The biliary system consists of the organs and ducts that are involved in the production and transportation of bile. The liver cells secrete bile, it is collected by a system of ducts that flow from the liver through the right and left hepatic ducts into common hepatic duct. 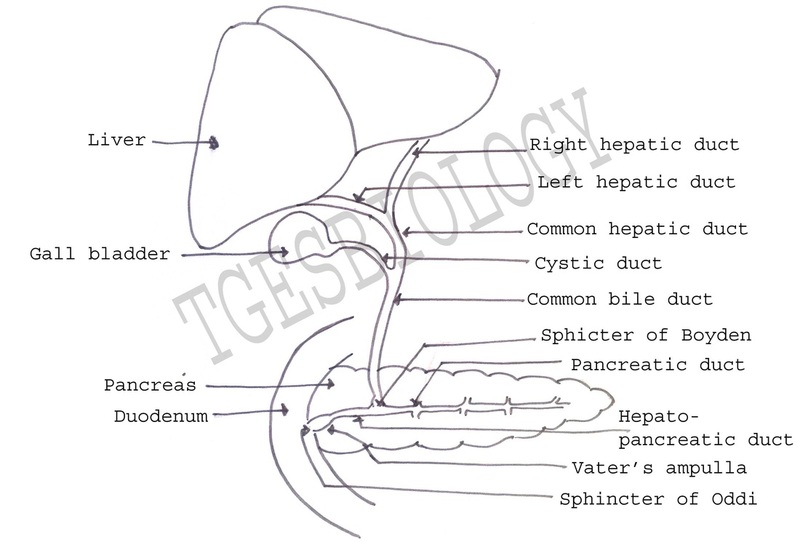 The common hepatic duct joins the cystic duct from the gallbladder to form the common bile duct, which runs from the liver to the duodenum. About 50 percent of the bile produced by the liver is first stored in the gallbladder, a pear-shaped organ located directly below the liver. 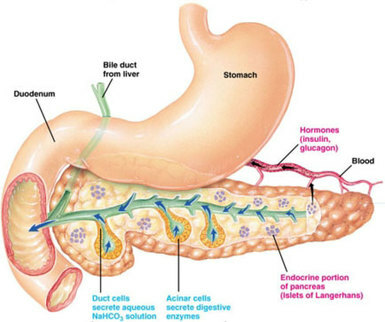 The gallbladder contracts and releases stored bile into the duodenum to help break down the fats when food enters the duodenum. 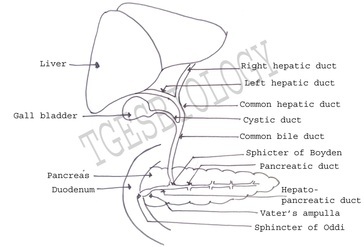 The opening of the common bile duct is guarded by the sphincter of Boyden, that then joins the hepato-pancreatic duct to open into the duodenum. This opening is guarded by the sphincter of Oddi. Food by mastication is converted to bolus in the mouth. It is passed to the stomach where churning and action of enzymes lead to formation of chyme, the partially digested food. In the duodenum, complete digestion takes place forming the chyle. 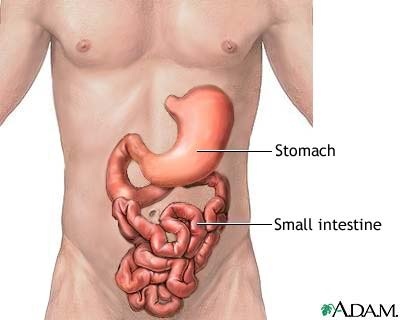 Watch the videos showing the process of digestion.